You are here: Home » Oh you fancy, huh? Nah, not really…. Oh you fancy, huh? Nah, not really…. Well it’s Monday and usually Monday calls for an easy meal. 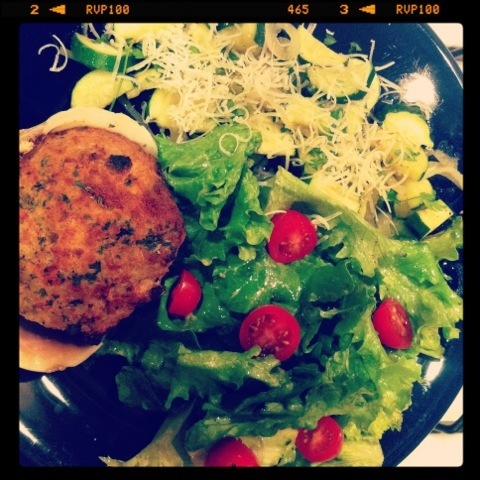 For me, it always take a day or two to adjust to the work week and get back into the routine of work, gym, and cook. 🙂 I had an amazing weekend filled with great friends at an annual outdoor festival in my neighborhood called Carnaval on the Mile which had fun live music and great street food replete with booths, food trucks, and restaurants. I really didn’t cook much this weekend (shocker! )–at least nothing that was blog worthy so let’s get back in the swing of things and talk about tonight’s meal. Everyone has those cheat meals–those meals that look fancy, like they took a long time to prepare, but in reality are super simple. This is one of those. Men, listen up!! This is a great dish to prepare even if you’re a klutz in the kitchen and I’m confident that it will impress any girl. One catch, she has to like seafood and veggies and you probably should too. 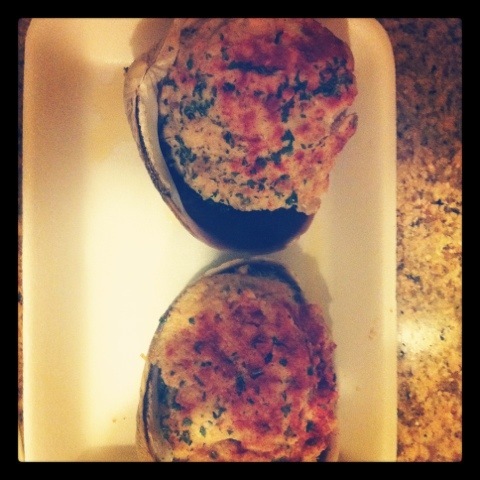 This meal is cheating to the MAX because I buy the stuffed clams in the seafood department at Publix and all I have to do is put them in the oven to bake. Told ya it was easy! If you don’t have access to a Publix–first, I’m sorry for you because you don’t get to experience the deliciousness of a Publix sub on a regular basis and second, I’m not sure you’ll be able to do this recipe. Perhaps your seafood department in your local store has something similar to this and you can improvise! Of course you could make these from scratch, but like I mentioned earlier I’m being lazy tonight and I’m cheating! Typically I make this with mashed potatoes which pairs with the clams wonderfully, but waaaaaaa (that’s my inner 5 year old whine). 😦 No carbs until the cruise (those beers and french fries this past weekend tooooootally didn’t count!) 😉 You, however, can enjoy it with some potatoes! Lucky! I’m so jealous…. Follow the directions on the label. I usually make these in my toaster oven because it’s easier than heating up my stove oven just for a couple little clams. They get a nice crispy crust on the top of them and the inside is soft and piping hot! Yummm, I’m drooling just thinking about it! Heat up some olive oil and sweat out your onions. 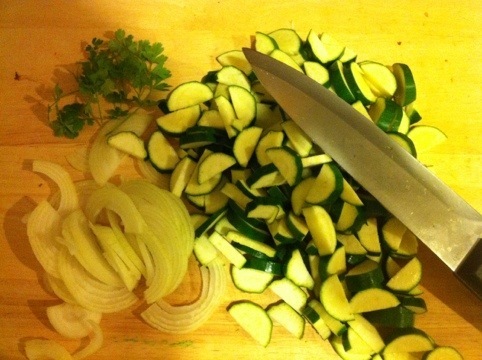 Cut the stem end off the zucchini and slice lengthwise in half , then place the cut side down on the cutting board and slice into 1/4 inch pieces. Make sure the pieces are pretty uniform so that they all cook evenly. Once your onions have turned translucent, throw the zucchini in there and season with salt and pepper. Add a little water (or white wine) and cover for a few minutes. After a few minutes you’ll start to see the zucchini becoming softer. It’s up to you how mushy you like them. I prefer them to be soft, but not mush. Dress with freshly grated parmigiano reggiano cheese and some fresh chopped parsley. Hope everyone’s week is off to a good start!! Here I am, great recipe Mel, sounds easy and looks great, but most of all…yum! Now I am going to try to do this right and post it! Love ya!